This product is customized for use throughout Europe, except UK and Ireland. What it does? 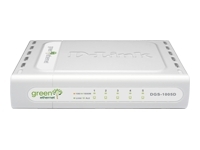 The DGS-1005D (Green Ethernet version) is an 5-port unmanaged Gigabit switch that consumes less energy than conventional switches of the same specification. This switch reacts when a device attached to it is turned off, by placing the corresponding port in a standby mode that requires less power. In addition, the switch is able to detect the Ethernet cable length and adjust power usage accordingly, hence saving any surplus power that would otherwise dissipate as heat. These two features combined can save up to 27% of the power used by the switch (figure based on a scenario assuming that PCs are used for 10 hours a day, powered off 14 hours a day and connected to the switch using 20m cables). This function allows the flow of data to be adjusted between switch and server, to ensure a reliable data transfer. At 2000 Mbps full duplex, the switch provides high-speed data pipes to your servers with minimum data transfer loss. All ports support auto-negotiation of MDI/MDIX cross over. This eliminates the need for cross over cables or uplink ports. Any port can simply plug to a server, a hub or a switch, using the usual straight-through twisted-pair cable.